Make your own model dairy farm with this craft book for readers 8 to adult. These sizable stand-up animals are made from die-cut card stock, and include several different cows and calves, a goat and kid, a couple of pigs, a small flock of Dorset sheep, a pair of Rhode Island red chickens, and a duck, donkey, barn cat, and border collie—26 animals in all. Just follow the painting suggestions provided for authentic markings (or paint them any way you like), add shading and details, make manes and tails from yarn, insert paper-clip stands, and glue the two sides together. 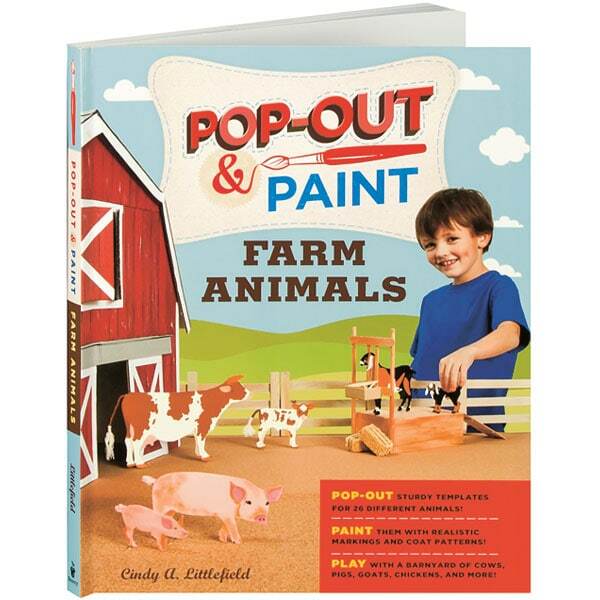 The book also provides instructions for building farmyard accessories like a barn, pig pen, milking stand, and feeder to keep your animals healthy and happy.